PRECISION makes luxury; we know that by now. There is no greater satisfaction than shrugging on an expertly-tailored bespoke suit for the first time, or popping open the cabin of one’s freshly-delivered roadster, customised to exact taste. The unforgiving attention to detail is doubly paramount in cooking, where artistry and chemistry must blend seamlessly, in time, to serenade four of our five senses. And so the dance around a simple-looking fillet of Japanese ayu (sweetfish) in the kitchens of two-Michelin-starred Waku Ghin, with beloved chef Tetsuya Wakuda as choreographer. Bring the best bud or loved ones to witness – and taste – the spectacle. Encasing the pliant, sweet flesh of the ayu is a crisp and golden brown skin that, with the lightest bite, parts most gratifyingly in the mouth. Behind the curtains, a temperature specific to each single fillet must be applied over an exact duration. Too hot, and char creeps into the equation, later unfurling unwelcome tendrils of bitterness that’ll ruin the ayu. Too low, and the skin comes away flaccid and unenthusiastic, and the realm of texture (crunch) is ceded to carelessness. The maestros at Waku Ghin, however, have the mastery down pat. Each dish is fine-tuned to the same degree of perfection, and the techniques are second nature by now. More than that, each offering comprises a well-thought out composition, its elements waltzing in harmony. The same ayu sits atop a mound of pomelo pulp and diced daikon, with a sprinkling of fennel supplying zest. The green smear of puree is made from water peppers – hauled in from the very area where the fish was caught. There’s a reason why Waku Ghin has earned a legendary reputation in Singapore and continues to be one of the island’s culinary beacons a good many years after its feted 2010 launch. Push past the frigid facade of the heavily frosted glass doors – a privacy shroud for diners within – and you’ll immediately be greeted by the warmth and attentiveness that accompanies a world-class establishment. This, combined with the exquisite Japanese-European cuisine, has earned the restaurant and Wakuda fans and loyal customers – the likes of David Beckham among them. Behind these doors lie a gateway to one of Singapore’s most beloved dining havens. If you’re here for one of two dinner sittings (5.30pm and 8pm), you’ll be led to one of four dining rooms, each seating up to six. 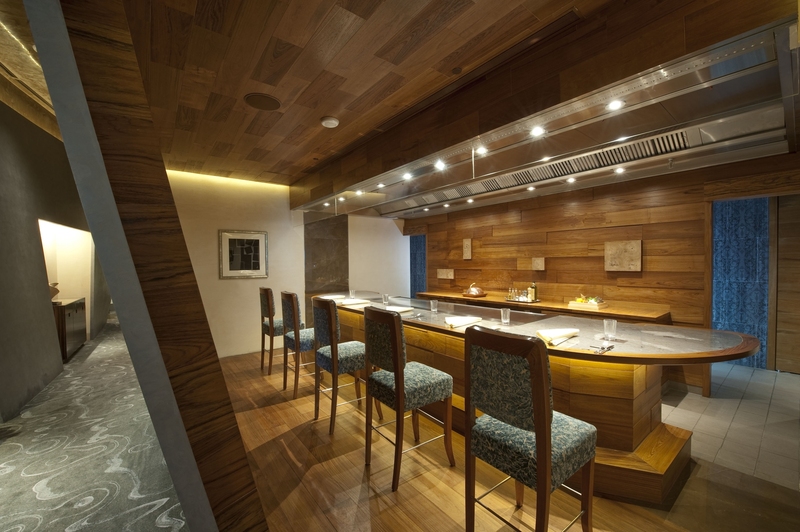 At the heart of each room is a custom-built grill, upon which some of your 10-course degustation menu will be crafted on. Seafood gets star billing at Waku Ghin; here, a succulent slice of Tasmanian abalone, served with white asparagus and butter sauce. Enter the attending chef, the conductor of the night, with a trove full of seasonal seafood offerings that differs with each visit. Delicacies like Hokkaido uni, giant Tasmanian abalone (pictured above) and Canadian lobsters fill the case – the latter two are presented alive; freshness guaranteed. When the chest is withdrawn, the feasting begins. Four cozy dining rooms allow for intimate sessions with an attending chef. You may be treated to an opener of Shizuoka tuna belly carpaccio – a buttery toro affair, sliced expertly to yield sinew-free slivers of the prized fatty section of fish. These are folded and plated so they’re only partway soaked in the soy and mirin dressing, allowing one to savour both the natural and marinated tuna. Then comes the iconic show-stopper that you have doubtless seen on social media, Waku Ghin’s crown jewel and piece de resistance: an ebony sea urchin shell housing hearty dollops of uni, set atop botan shrimp and crowned with a generous mound of Oscietra caviar. Don’t let smartphone antics detract too long from savoury heaven, and pick up the accompanying mother-of-pearl spoon. A regular one won’t do – after all, its metallic taste would get in the way of the caviar and uni. What ensues will be nothing short of exhilarating, as the sweet and soft shrimp plays perfect foil to the luscious umami uni, interspersed with the rich caviar offering bite and little explosions of briny goodness. Those who wonder how Oscietra can gel with its gentler counterparts in the dish need not worry; Wakuda’s painstakingly sourced pearls from a particular French company that runs a sturgeon farm in Asia, and the chef’s stipulated a very much bespoke combination of texture, size and reserved saltiness so diners get a wonderful balance of the trifecta. While you’re still reeling from the experience (and potentially contemplating who to bring on your next visit so you have an excuse to have it again), the grill’s fired up. In season right now is the Hokkaido king crab, the legs of which are already treated with a fragrant mix of lemon-scented EVOO. Sea salt and oil are poured onto the grill, then fashioned into a mound upon which the legs will sit. A bamboo leaf to trap moisture is placed before the get-up is covered with a lid. The salt bed takes on the steam gradually, and two minutes later you’re allowed to dig in. Once the meat is eased out (almost effortlessly, we might add), a delectable combination of Shodoshima extra virgin olive oil with lemon juice and dashes of pepper and grated lime tops it off. The result? Piquant mouthfuls of crab, hearty and palate-lifting. The seafood odyssey continues with braised lobster – cooked in similar fashion but instead with a rich broth that’s been sitting on a simmer for 20 hours. Finishing the flesh is preserved lemon, butter, ground pepper, fresh tarragon and olive oil. It’s then served with wakame seaweed and, crucially, chunks of freshly-baked bread that’ll be instrumental when you find yourself scouring the plate so you can savour every last drop of the umami bisque. You’ll have worked up quite the palate now for the Ohmi A5 wagyu – a deliciously marbled cut of sirloin just begging to be worried away by the teeth. As with all exceptional steak, only salt and pepper was used in the seasoning, though ponzu is available. On the side, garlic chips, spring onions and Okahijiki seaweed, which interestingly is a prized species that grows on land. But your experience at Waku Ghin is not complete without the last element – its freshly-grated wasabi is a divine accompaniment to try. Wakuda’s mandated the use of a grater – customised, of course – that results in the slower oxidisation of the wasabi while also yielding a creamier texture. This means a milder, ‘rounder’ paste that only gently titillates the senses, and when employed liberally on the steak, relieves the palate continually from the delicious fat, leaving the senses caught up in a dizzying loop of ecstasy. The mastery at Waku Ghin extends to its dessert – ranging from light creations like Cointreau granita with the quintessential Japanese musk melon, to fromage blanc sorbets paired with fresh wild strawberries. Savour these as the spectacular view of the MBS lightshow Spectra (8 and 9p.m. every day, extra show at 10p.m. on Fridays and Saturdays) floods in through the windows – to wrap up a night to remember. Waku Ghin. Level 2 Dining, L2-01, The Shoppes at Marina Bay Sands, 2 Bayfront Avenue, Singapore 018956. Tel: +65 6688-8507. Dinner sittings: 5:30pm and 8pm. The Bar: 5:30pm till late.